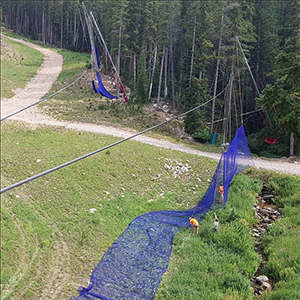 The Talon Crew began hanging A-Net for the Birds of Prey World Cup in August. The Birds of Prey World Cup race week doesn’t officially begin until the first downhill training day November 27, but in truth, the event has already begun in the minds of race fans all over the world who anticipate this legendary contest of grit and willpower on the slopes of Beaver Creek, Colorado. The first sign was the photo of Talon Crew hanging A-net on course, which hit Facebook on Aug. 16. And another good omen from the racing gods hit the Vail Valley Sept. 19, as heavy rain turned to overnight snow on the high peaks. The biting air of autumn turned fierce for a few hours, and the unmistakable scent of snow drifted down from the highlands. For those of us here at the Vail Valley Foundation, all of the above has already got our blood racing. It’s also got us wondering: who will be the next nine medalists to take the podiums here in Beaver Creek? Aksel Lund Svindal of Norway has won the past two Beaver Creek Birds of Prey World Cup downhills. Photo by Alexis Boichard, Agence Zoom. Top of that list comes the one-and-only Aksel Lund SVINDAL (NOR). He has won gold the past two downhills held in Beaver Creek (2016 and 2018), doing so while wearing the No. 1 bib in 2018. As charismatic off the slopes as he is fearless while on them, Svindal seems to intimately know every idiosyncrasy of the Birds of Prey track, and has become a fan favorite in Colorado here and beyond – plenty of American fans cheered as he skied his way to the No. 2 overall downhill title in 2018. It was his fourth time winning the Birds of Prey downhill race, eclipsing the legendary Hermann MAIER (AUT) who has three downhill wins on the course, including the 1999 Alpine World Ski Championships race. His greatest competition may come from his own home country of Norway in the form of Kjetil JANSRUD, who placed seventh overall in the men’s downhill standings last season, and took silver in last year’s Birds of Prey super G.
Both those racers must content with Beat FEUZ (SUI), who is the reigning downhill champion from the 2017-18 season, and who was a mere .15s behind SVINDAL in the 2017 edition of the Birds of Prey World Cup downhill. FUEZ also ran early in last year’s race – winning with bib No. 3. 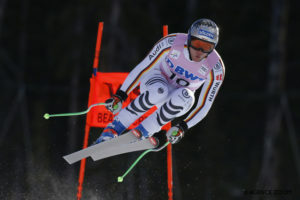 However it was bib 10 that took third, as most German race fans will recall, as Thomas DRESSEN (GER) earned the first German downhill podium since 2004, when Max RAUFFER won in Val Gardena, Italy. Among the seemingly endless variables that will determine this year’s champion are the course conditions. Last year’s track was nearly all man-made snow, and warm temperatures favored the early-morning runners. If the crystal-cool air currently floating through the Vail Valley has anything to say about this season’s conditions, however, a more wintry mix will be in play when this year’s race week comes to town. The accomplishments of Marcel HIRSCHER (AUT) are so impressive as to seem fabled – or at least a little embellished. And yet there is no embellishment to this astounding statement: this one phenomenal athlete has been the World Cup overall champion a record seven times in a row, dominating the tech events to such an extent that no other skier can match him. Five of the past seven years, HIRSCHER has also captured the Giant Slalom overall title – but in Beaver Creek, he has historically struggled to beat the home-turf favorite: Ted LIGETY (USA). LIGETY was Giant Slalom overall champion five times (2008, 2010, 2011, 2013, and 2014) and won the Beaver Creek Birds of Prey giant slalom five times in five years (2010-2015), but has struggled with injury of late. The giant slalom specialist dipped in 2016-17, but made notable strides back to form in 2018, placing eight overall in World Cup giant slalom standings. LIGETY’s status, however, remains a mystery. Only time, and training, will tell just how well this veteran of the World Cup will bounce back. In the meantime, he and HIRSCHER have some new blood to contend with, namely in the form of Henrik KRISTOFFERSEN (NOR), who took silver at the Birds of Prey World Cup giant slalom and second overall in the World Cup overall rankings. Fast on the heels of HIRSCHER, KRISTOFFERSEN is making his bid to be the next dominant racer on the World Cup tour, and there’s no better place to establish that dominance than in the early season, on the highly-competitive Birds of Prey track. The super G is shaping up to be a tug-of-war between Austria and Norway, with France doing their best to play spoiler. 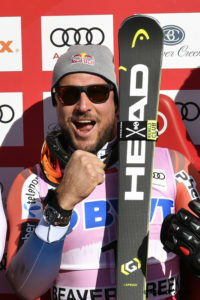 JANSRUD is the two-time defending overall super G champ, and has been close to the top position in Beaver Creek before. However, the powerful Norwegian has yet to gain gold in Beaver Creek, taking silver in 2014 and 2017. This could be his year. 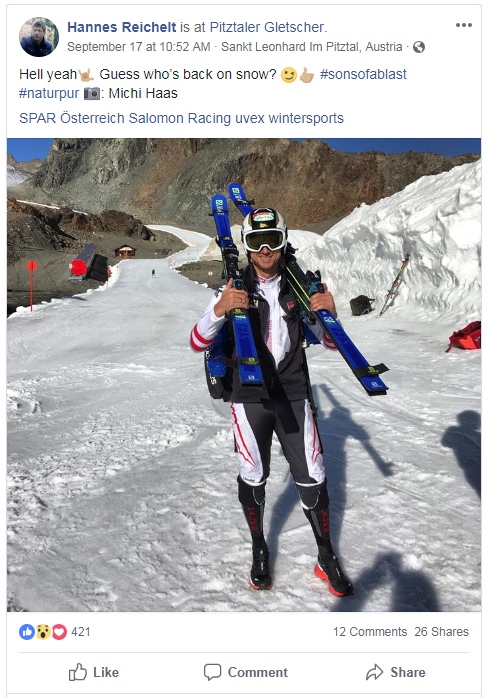 But to get there, he’ll have to overcome an Austrian team slated to include Vincent KRIECHMAYR, the reigning gold-medalist on the Birds of Prey super G.
Then, of course, there is Hannes REICHELT (AUT) who earned bronze here last year at the impressively mature age 37, and is already back on snow, training for yet another year of an historic World Cup racing career. HIRSCHER has shown he can win here in this discipline – proven by a December, 2015 victory in super G. And guess who was hot on his heels that year? Ted LIGETY, who took silver in that race. He was followed by Andrew “The War Horse” WEIBRECHT (USA) who is now retired. If the USA wants to make its mark in super G, it will most likely come from Travis GANONG (USA), who took sixth in 2015 but only 33rd in 2017. A lot of work remains for the USA if they seek to return to the heyday of Bode MILLER and Daron RAHLVES’ performances of the early/mid 2000s. And then there is Steven NYMAN (USA), who can claim a huge fanbase in Colorado and has shown best-in-the-world promise over the course of his career. NYMAN, however, is in somewhat of a similar circumstance as LIGETY, and recent injuries have put the speed-event specialists career in limbo. Many questions remain, but when winter comes to Beaver Creek, so will all the answers.